Burger King, apparently not content with resting on the laurels of their Mac & Cheetos, have now added some of that Cheetos dust to their chicken fries, and if you like their chicken fries but wish there was a hint of cheese flavor, you’re in luck. 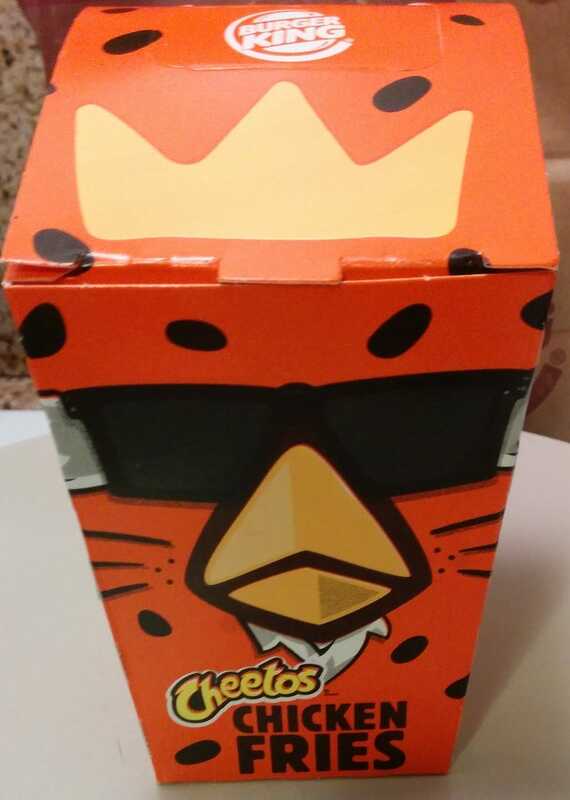 They also put some work into the box with it’s Chester Cheetah turned into a chicken design. The top picture is the front, and of course his tail is on the back. And a side profile on one side. The other side just has a hashtag for the Cheetos chicken fries. And they keep it up under the lid too. As for the actual Cheetos chicken fries, they basically taste like the regular chicken fries, which taste like a hybrid of a chicken strip and nugget, but with a hint of cheese, and it works. No dipping sauce needed. I tried it with both ranch and ketchup and they tasted better on their own. Each box has 9 of the Cheetos chicken fries, and you can get them alone or in a meal. For some reason, BK has yet to offer chicken fries as a substitute for the regular fries (or onion rings) in a combo. I’d even be willing to pay a little extra for that. If you’re looking to have a full on chicken themed dinner, their grilled chicken burger is pretty good too. It has a ground chicken patty rather than a chicken breast filet, and that makes all the difference. Chances are this is also for a limited time only, much like the Mac & Cheetos which are no longer being offered. Enjoy!